Nick Silva barrels through for a long gain against Sachem East. He leads the Colonials in rushing with 43 carries, 382 yards and 6 touchdowns through four games this season. 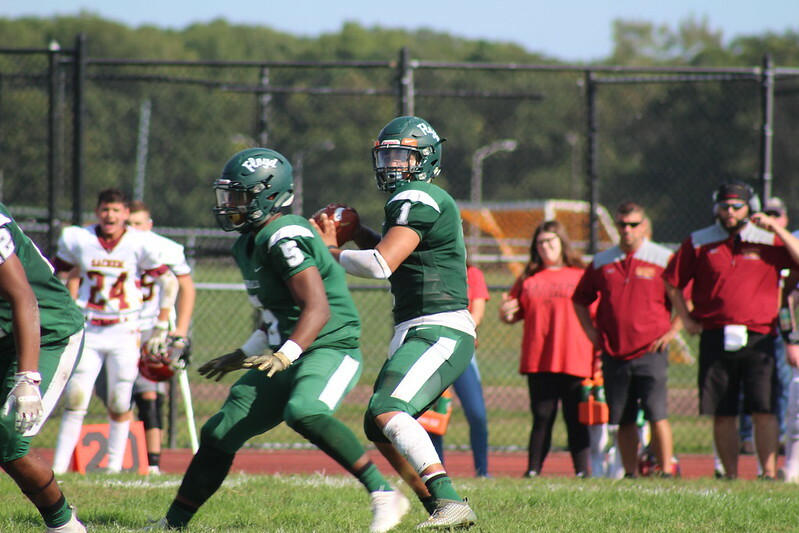 The William Floyd Colonials varsity football team has topped the New York State Sportswriters Association (NYSSWA) Class AA rankings as the best large school high school football team in New York State with half of the regular season now complete. So far this season, the Colonials have featured a high-octane offense and a stifling defense outscoring their opponents 173 to 38 in four decisive victories. This is the first time that the Colonials have garnered the top state ranking since 2007, the last of their three consecutive undefeated championship seasons. Newsday’s High School Sports has also ranked the Colonials as the No. 1 large school football team on Long Island. The Colonials are helmed by head coach Paul Longo, the legendary high school football mastermind who has engineered a program that is second to none and won 10 Suffolk County Championships and five Long Island titles. This year’s Colonials have won each of their contests in blow-out fashion in which they are averaging more than 43 points per game on offense and less than 10 points per game allowed on defense. Stand-out individual performances so far this year include dual passing/rushing threat Mack Driver, running backs Nick Silva, Tyshaun Lopez and Zion Wellington; wide receiver Jordan Clinton and sparkling on defense Silva, Driver, Gary Anderson, PK Kite, Keith Winfrey and others. The Colonials visit Central Islip this Saturday, October 6, before hosting Ward Melville on Homecoming Day on Saturday, October 13. They close out the regular season with games against Sachem North and Connetquot.